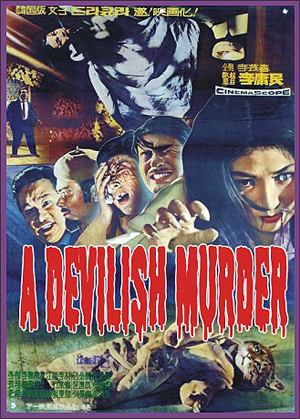 A DEVILISH MURDER—Widescreen Edition (1965) Ye-chun Lee, Do Geum Bung, Ae-ran Jeong, Bin-hwa Lee, Kung-won Nam. The cat-like creature-ghost of a beautiful woman terrorizes a family in their neighborhood home. It turns out the creature is the ghost of the man’s dead wife, who was murdered by his own mother and jealous cousin. The ghost (who reflects as a cat in the mirror) begins a reign of supernatural horrors that will leave the viewer almost breathless. This is one of the wildest horror films you’ll ever see, piling on one horrific scene after another, leaving you only short moments to catch your breath in between. A must! English Subs. (PLEASE NOTE: On this DVD you will need to turn the subtitles on from your DVD player menu, not from the disc itself.) Widescreen, 35mm.